United Airlines disciplined the flight attendant after the Islamophobic accusations. A flight attendant who refused to give a Muslim passenger an unopened can of Coca-Cola, allegedly telling her it could be used “as a weapon,” will no longer be serving customers for that airline, the company said today. United Airlines issued an additional apology for what occurred on Tahera Ahmad’s Shuttle America flight from Chicago to Washington, D.C., last week, noting that after investigating the incident, the flight attendant will no longer serve United customers. Shuttle America is a regional airline affiliated with United. “While United did not operate the flight, Ms. Ahmad was our customer and we apologize to her for what occurred on the flight,” United said in a statement today. A passenger on the plane says the woman is lying. I was actually on this flight on Friday evening from ORD to DCA. I have been a reader of this forum for a long time but seeing this all over the news made me sign up so I could tell you what really happened here and hopefully stop this liar in her tracks. I was sitting close enough to her to hear everything that was said. The flight attendant came up to the lady (I believe she even took her order first in the entire cabin as she was seated in the bulkhead 7d) and took her order. She ordered a coke zero and a hot green tea with a Splenda. The flight attendant handed her a full diet coke with a cup on top and then told her that the green tea would take a few minutes and she would get it to her ASAP. The lady said very rudely and condescending to the FA that she ordered a coke zero and basically pushed the soda back to the flight attendant. 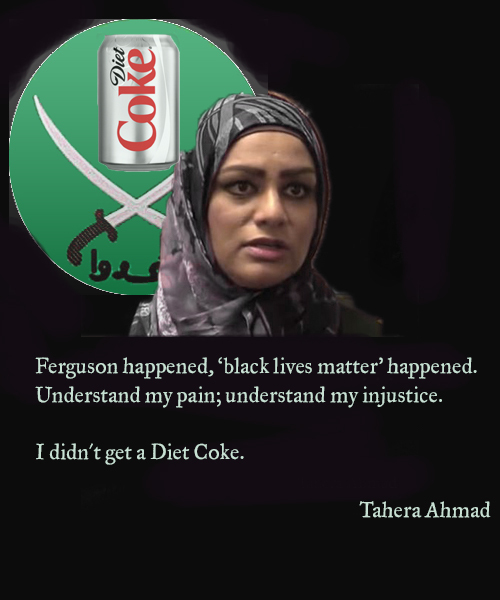 The FA said she was sorry and attempted to find a coke zero for her (which she did not have many of) and told her that she could only give her a portion of the can not the full can. This is when the lady in question started to freak out and told the FA “What do you think I will use this as a weapon?! Why can’t I have the whole can? I think you are discriminating against me. I need your name….” The lady just kept yelling to her “I need your name… I am being discriminated against.” This is when a few passengers told her to calm down and one guy told her to “shut her mouth and she is being ridiculous over a can of coke”. No one ever said anything anti-Muslim to her at all. She was the one who started screaming discrimination when she did not get what she wanted. The FA asked her numerous times if she would like anything else when the lady just basically pushed her away with a hand in her face. The lady then got onto her phone with her credit card and paid for the internet so she could start spinning this story on social media and she was never in tears. This person is a liar plain and simple and is just pulling the discrimination card.